It’s been forever since I’ve done a nail art look. But for good reason! There hasn’t been a time in the past six months where my nails were the same length – I just keep ramming them into walls and breaking them (this is why I can’t have nice things). After trying a new brand of Biotin gummies, my nails managed to stay in one piece long enough to do a nail art look. As always, this look is very easy to achieve. You just need a bunch of colours and a little bit of patience. 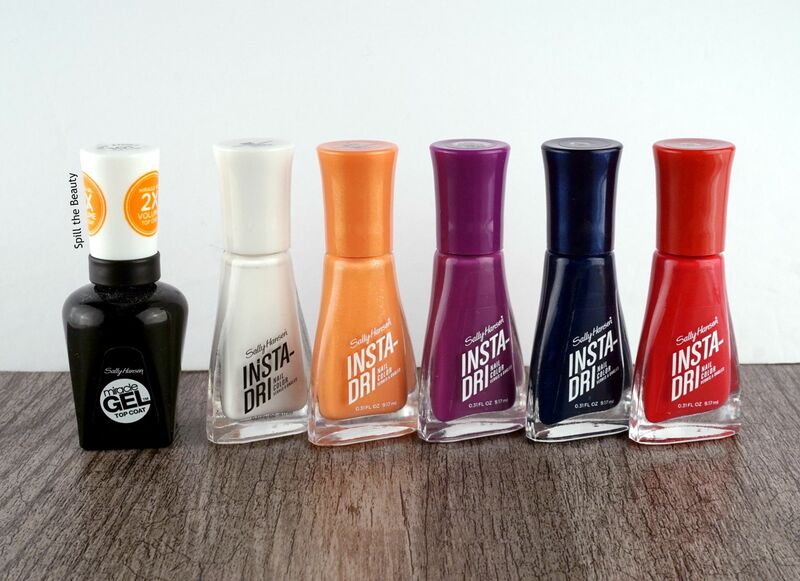 I used shades from the new formulation of Sally Hansen’s Insta-Dri collection. The formula is supposed to be longer-lasting, quick-drying and only require one coat. And as a bonus, the caps match the shade inside. While I usually like to go step-by-step for tutorials, this one really has one main step repeated a few times. Once you paint your base (I used White On Time), you’re going to choose your first colour. Using the dry-brushstroke technique you’re going to remove as much nail polish from the brush as you can by wiping the nail polish off in the neck of the bottle. Once you think you have wiped off enough, you’re going to lightly swipe the brush on a scrap piece of paper. If that swipe leaves a scratchy-looking swipe effect, you’re ready to paint. 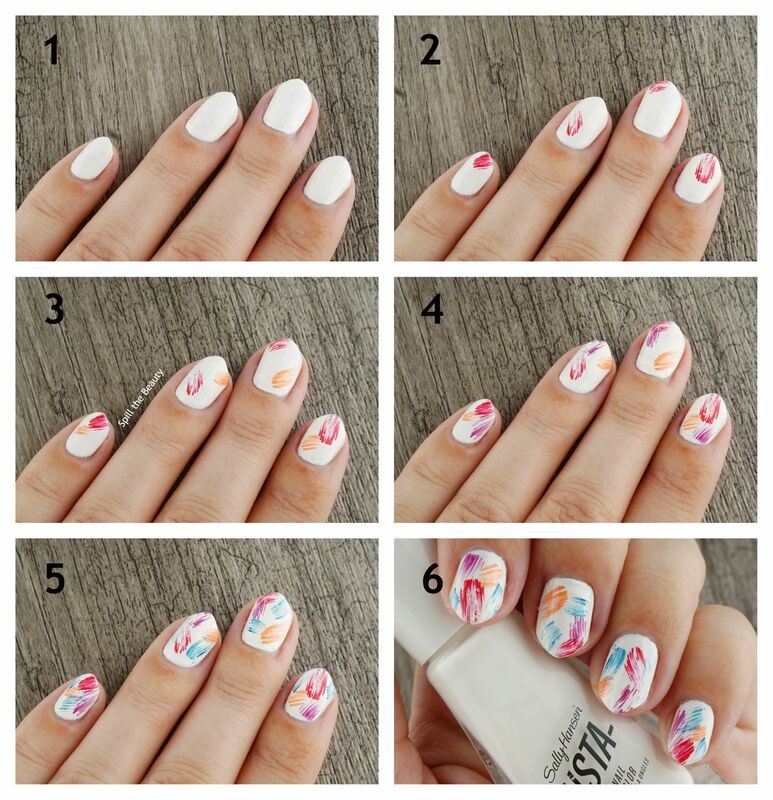 Do that same soft swipe one time on each nail, swiping in different directions. 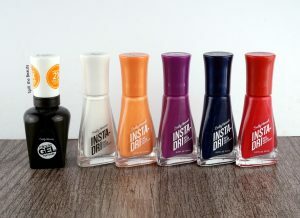 Then repeat that step as many times as you like with different clours (I used Let’s Jam, Peach Buzz, Va-Va Violet and Midnight Drive). Seal it with a top coat (I used the Miracle Gel Top Coat) and you’re good to go! 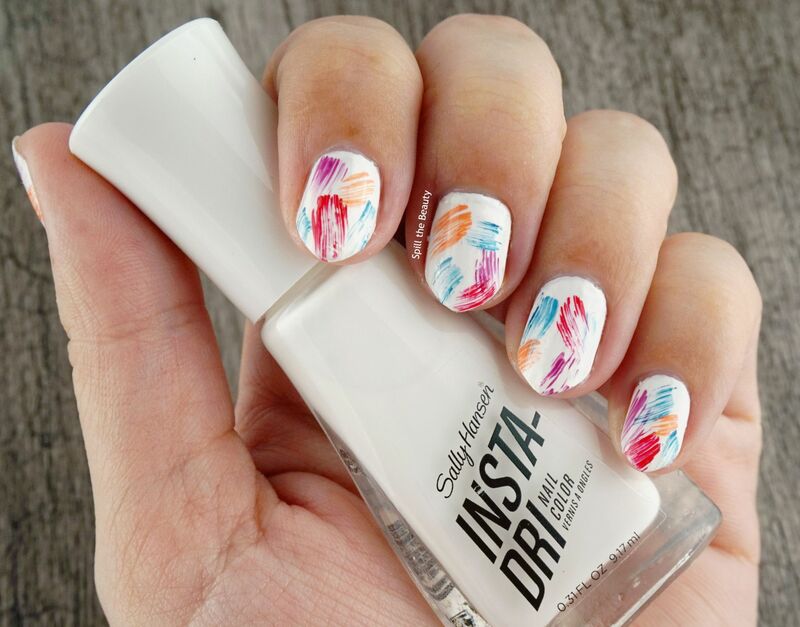 Love the nail look you created, it looks so fun for the, hopefully, upcoming warmer weather.